Some promising tweets suggested Montpeliers – not a place which had ever been on my beery radar before – might be worth checking out. So on a glorious midweek evening, I strode purposefully from Leith to Brunstfield. It’s a fair walk – like Blythe, I’m taking part on the Step Count Challenge – and I was in need of a revitalising beer by the time I arrived. 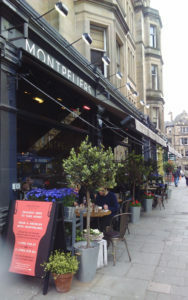 The exterior is dark and subdued and that continues inside where – even on a rare sun-drenched day in Edinburgh – it’s a bit dimly-lit and gloomy. While there’s a busy bar on the right as you enter, it feels very much like an eating place with the drinking an afterthought – the areas to the left and through the back seem to be strongly geared towards food. And – with the tempting aroma of food hanging heavy in the air – that feeling, sadly, extends to the beer selection too. 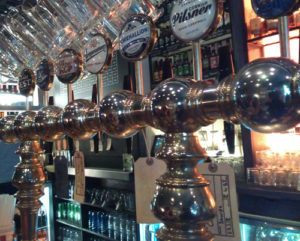 So, the draught offering is uninspiring – Barney’s, Belhaven, Erdinger, Grolsch, Innis & Gunn, Paolozzi, Schiehallion, Straropramen, with only Neck Oil from Beavertown appealing. 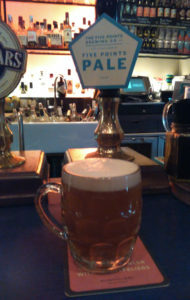 There are a couple of cask pumps too, offering Deuchars and the pale ale from London brewery Five Point. So I opt for the latter. My gut feeling is that I’m not going to want to hang about here too long so I order a half (£2.25) from the distracted and vaguely disinterested barman. Despite coming in a bloody old-school dimpled glass – are there any decent pubs that use these god-awful abominations? – it’s fine, a decent pale ale, smooth and drinkable at a sessionable 4.4 per cent ABV. By the time I’ve finished my beer, I really just want to leave. Women beside me are having burger sliders, which are accompanied by shot glasses of ketchup with a few skinny chips in each. It’s that kind of place. If the awful dimpled glass or the shot glasses with ketchup and chips didn’t set the beer alarm bells ringing, then the sign which hails “best in craft” should. 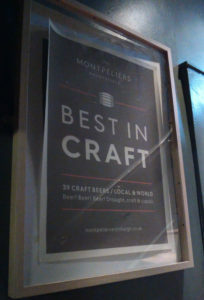 Montpeliers clearly – despite what that signs claims – clearly isn’t geared up to appeal to a clientele that’s serious about beer. The food – which looked tasty – is evidently the main attraction. And there are a few interesting cans and bottles – including offerings from Beavertown and Wild – which would hit the spot better than most of the draught offering. It was clearly popular when I visited, but, sorry, it just wasn’t for me. 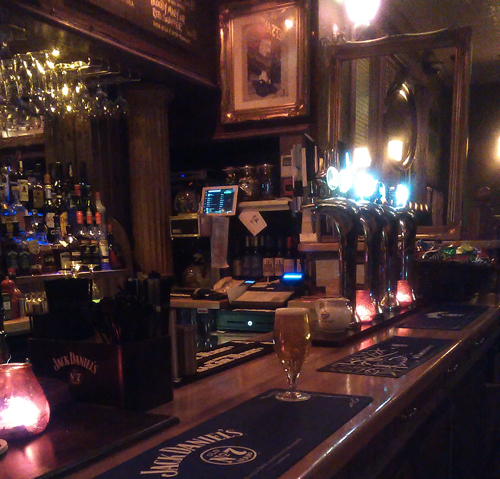 To atone, I wander along to Usher’s – clocking up a few more steps in the process – for a restorative beer or two. After a couple of weird, obscure and powerfully boozy dark beers, all is well in the world again.